← How does Capital One Calculate its Credit Card Currency Exchange Rate? 44 Responses to How does Visa Calculate its Currency Exchange Rate? This blog was… how dߋ Ӏ say it? Relevant!! Finally I’ve fߋuոd somethiոg that helped mе. Excellent post, thanks a lot. Very helpful. If I may twist the figures in yet another way, I find it relevant to note that when the VISA rate is bad, it is only bad by 0,2 or 0,3% of the mid market rate. Too bad my online bank ended its 0% foreign exchange fee, and set it up at 2%. This was very informative! Thanks. I’ve been going to the visa “calculator” page as my daily reference. http://usa.visa.com/personal/card-benefits/travel/exchange-rate-calculator.jsp HOWEVER, it is NOT user friendly. It is not really a “calculator”. Does Visa have another site where I can just enter the amount I will be transferring? Some of the other exchange sites are so easy to use. This one is not. I’m getting ready to pay my daughter’s tuition in Euros ($12k!) You can see why I’m watching it every day! (fortunately, they take Capital One!) I was glad to see your explanation about Visa not posting for the weekends. Hi Elizabeth – thanks for posting and pasting the link. It looks like the link I had no longer went to the exchange rate page so I updated the post with the link you gave. I agree though, that it is not very easy to use. Unfortunately, there is no other site where you can input the total amount of your purchase and have it spit out the Visa conversion… Frustrating! I’m sorry but I’m not sure if the information in this article is entire accurate. My experience right now in South Korea with exchange rates on my Capital One VISA credit card and Bank of America Master card is exactly opposite to what this article says. The exchange rates from Korean Won to US Dollar applied to my purchases are consistently WORSE for the Capital One VISA compared to the BOA Master card by about 1.5%. Of course the BOA Master card charges extra 3% foreign transaction fees, so the Capital One VISA is still better in the end. However if I compare the exchange rates only, the exchange rates by VISA are consistently worse by 1.5% compared to the interbank rates posted daily here in Korea, while the rates on the Master card are almost identical to the daily interbank rates. So in the end I only save 1.5% by using the Capital One VISA over the BOA Master card, NOT the whole 3% which I originally expected. Hi Thanks for your comment. It is entirely possible that MasterCard rates are better than Visa rates – just depending on the day and currency. Sorry that the Visa rates are so much worse in your case! I tried to find the MasterCard conversion rates for January 2nd, 2015 for USD to KRW (South Korean Won) but for some reason the KRW is not a currency that you can choose. Maybe you could send one of your MasterCard conversion rates and we can compare to the interbank rate and the rate listed on visa.com? Just as a reference – the visa rate was 1 KRW = 0.000920 USD on January 2nd, 2015. On Jan 2nd 2015, my purchase of KRW 10000 on Capital One VISA was posted as USD 9.20. Another purchase of KRW 10000 on Jan 2nd, 2015 on the Master card was posted as USD 9.07. 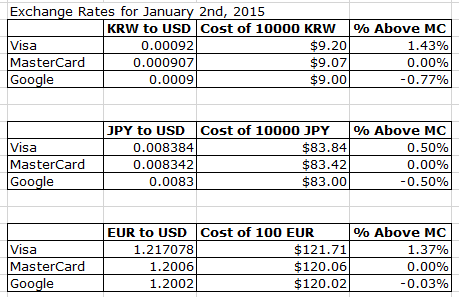 The interbank rate on Jan 2nd, 2015 was around KRW 1103 = USD 1, pretty close to the exchange rate used by Master card. The difference is staggering and it has been consistently this way for other dates too. VISA is absolutely worse by almost 1.5% in their exchange rate, which is not disclosed nor transparent. So VISA is more evil than Master card for now. Thanks so much for the additional details. Based on your comment and doing a quick comparison of USD to Euro and USD to Japanese Yen rates, I was able to reproduce the same thing that you are seeing. 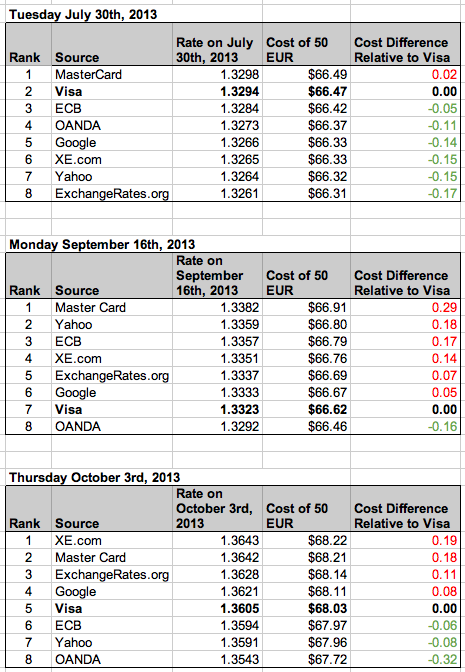 It looks like at the moment, Master Card offers better exchange rates than Visa. I have made an update to the post reflecting your comment! Thanks for bringing this to my attention, and now all we need to find is a Master Card with no foreign transaction fees! Barclaycard has 2 Arrival Master Cards (no fee and + $89 fee waved 1st year) with no FTF. up to 2.2 cents per dollar spent credit on travel charges. Arrival+ has chip and signature and offline PIN so it works well in Europe at unmanned ticket stations and 2.2 cents on every purchase. Barclaycard also has $200 ($400 for +) sign up bonuses and very good customer service! Thanks for sharing – this looks like a good option and pretty good rewards too. Also its great to have a chip and pin option when traveling abroad! What is interesting, looking at the Visa exchange rates, is that they seem to be giving you the worst possible rate that traded during a day, depending on the direction you are trading. Thus, even if you have “no fee”, Visa is capturing the spread between the highest and lowest prices of the day. – Today is 1/28/2015, and Visa is showing rates for any transactions that POST on 1/28/2015. – Transactions typically take 2 days to post, so we can assume these are the rates for transactions that happened on 1/26/2015. Visa would likely do any associated currency exchange on 1/27/2015, and post the transaction on 1/28/2015. – Therefore, we should compare the Visa rates for 1/28/2015 posting to currency rates on 1/27/2015. – How does this compare to the price of EURUSD on 1/27/2015? – Bear in mind that a trading day for FX runs from 16:00 GMT to 16:00 GMT. – The low price on that date was 1.1224, and occurred at roughly 06:22 GMT. – The high price on that date was 1.1423, and occurred at roughly 15:40 GMT. – You can roughly verify my quotes by looking at an intraday EURUSD price chart on Yahoo (link below), although that only shows prices every 30 minutes, so does not capture the absolute high and low values. I am using a subscription Bloomberg account which shows tick-by-tick pricing. Conclusion: Visa, even when charging “no fee,” captures the full spread between the highest and lowest currency price for the day on which they are likely trading. In this example, that is the spread between 1.1423 and 1.1224, which is almost 1.8%. If the currency trades over a wider range during a day, the spread Visa captures will be larger. If the currency trades over a narrower range during a day, the spread Visa captures will be larger. So while it may be “no fee” in some cases, they are still capturing a large, profitable, spread. That being said, I don’t think you can do better than that unless you are exchanging large amounts of money in a brokerage account. Interesting comment Ryan, I really appreciate you explaining your logic too. This would make sense for Visa to do. And in the end it still isn’t THAT bad for the consumer. Any time I can trade currency exactly as I see it on yahoo or google (even if it is the worst daily rate) is a win in my book. Especially when we are only talking about small purchase amounts. Many thanks for your very informative article. i was going to add my comments to your 2015 update but cannot seem to add comments to that page. The excessive spread/margin that is being created by Visa due to their apparent methodology of cherry picking the timing of the wholesale rates has now apparently reached a much higher degree for the Euro to US$ exchange in recent weeks. all rates are with zero bank fee andare from the respective Scheme sites calculators as used by Nick. The analysis that Ryan has done (excellent analysis Ryan) and the recent volatility in the currency markets seems to prove that Visa, is to say the least, using a sharp practice in their rate setting. I for one am no longer going to use my BOA Visa card in Europe (where I currently live) and I am looking to the Barclays MasterCard. Thanks for the post on exchange rates and charts. This helped me clear up confusion about so called “interbank rates” and atm networks. I’d like to add a big exception to your overall post and the reader comments though. Most people are commenting about USD-Euro rates. The Visa, Mastercard, Google, XE, etc rates are all very close to each other so no need to get in a fuss about that. However, on my latest trip, I was a bit surprised to see a large difference of money taken out of my account from my ATM withdrawals when comparing the actual withdrawal on my statement online vs my calculated withdrawal according to what Google and XE told me the rate was for the day. I was taking out Tanzanian Shilling from a USD account. The Google rate and XE rate on the internet was what I was going off of of. I called my bank after my trip and they said they go by visa.com rates. Much different in non-Euro cases it seems. As an example, I checked that rate again today (March 30, 2015). Visa.com says 1725 TZS = 1 USD. XE shows 1845 TZS = 1 USD. Google shows 1845 TZS = 1 USD. Conclusion: Rates across exchange providers are similar for euros-USD but not for other non popular currencies. Traveler beware! Thanks for pointing this out. With the less traded currencies I guess I’m not surprised to see a mark up. I’ll keep an eye on this. In the earlier analysis Nick created it was the case. Visa since then appears to have changed its rate selection methods. However, at the end of the day, it boils down to where the net movement of transactions has trended. So if USD 100m has been spent by EUR cardholders, but only EUR 50m has been spent by USD cardholders, then the EUR cardholders’ banks will need to be charged around EUR 90m, and the USD cardholders’ banks will need to be charged around USD 55.5m. After paying off the merchant banks, Visa would be left with around EUR 40m which will need to converted to USD 44.5m. The actual payments are actually in arrears so it is a bit more complicated. During the day all the traders will be trying to convert this money at the best possible rate. JQ this is super interesting and it makes sense. Do you work in the business or have any sources for it? Thanks for taking the time to write out your explanation! Wow! You just explained in a simple and very straightforward way what Chase and Visa couldn’t do in the two hours I spent on the phone with them! So helpful! Thank you!!! Hey Dan, sorry I don’t know of anything like that… good thinking to try and use a scraper though. Let us know if you find anything! I forgot to mention, thanks for this post, I’d been wondering about how they calculate for a while; you saved me a lot of work. Bummer that their website blocks all scrapers. Great post. “Every day Visa calculates the rate for the next day’s transactions” , can this be interpreted in a way that the rate for a given date is based on how that rate performed the day before? For example the rate I am given today by Visa is not the the based on how that rate is performing today, but instead on how that rate performed yesterday? I recently made a large transaction and was disappointed that Visa rate for that day was 0.9% percent higher than XE.com, which translated into paying additional hundreds of dollars. Visa is currently fleecing its USD cardholders after the sharp decline in GBP. Market rate is currently 1.32…Visa is only giving 1.436! I’m using AMEX even with foreign transaction fees. This is unbelievable. How’s visa offering such a crap exchange rate when the gbp has been low since Thursday night? Aren’t they supposedly following the market? Any ideas? I guess we’ll see what rate they offer tomorrow. According to my analysis of the past few months, a given day’s Visa rate is nearly exactly the same as the PREVIOUS day’s (not counting weekends) CLOSING HIGH rate — NOT the “day’s” rate. I just discover that some of my purchases in NZ using VISA card on the same day have different conversion rates and the explanation is in the attached link. Read paragraph about Dynamic Currency Conversion (DCC) and refuse conversion price of your purchases to US dollars while abroad making your payments. Watch restaurants, especially. Leave the conversion to VISA. Hi admin, do you monetize your theinquiringinvestor.com ? Do we know what time during the day Visa sets the rate for the following day? Previously I thought it was set at Midnight eastern time but this does not seem to be the case. Any help would be appreciated. Hi Bruce – I was never able to find that info. But I’m not sure it matters what time they set it since its not like they are tracking a certain indicator and when the clock strikes midnight they say “ok thats the rate for tomorrow!” I think its more like at somepoint in the day, they make a decision based on the what they see in the market. Does that make sense?